Like many people who grew up in the 80s and 90s, I’ve listened to lots of R.E.M. in my life. By far my favourite R.E.M. 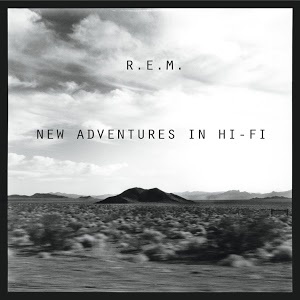 album is (still) New Adventures in Hi-Fi. It’s a little bewildering to realize that album turns 21 this weekend. So what’s so great about it? One reason I love that album so much is because it features one of my favourite R.E.M. songs. “Be Mine” is glorious. If you haven’t heard it yet, or if you haven’t heard it in a while, do yourself a favour and add a copy to your library. And if god forbid you don’t know R.E.M. at all, this album is a great introduction. You can thank me later. The song is a kind of love song, although it may take you a while before you realise how raunchy it is. It starts off by invoking the Easter Bunny and Christmas trees, which are both fertility symbols, and it just gets better from there. Once you get to the imagery of the Grail, you realise that the singer is laying down some serious propositions here. Anyway, it’s great. Even if the song may sound like a mixed metaphors marathon, the lyrics always make me smile. I recommend listening to the whole album. For bonus points, read the Wikipedia article about the band’s recording process for this album, and some insights into the subject matter. This album is the kind of thing that really rewards the listener for paying attention. “Electrolite”, “E-Bow the Letter”, “How The West Was Won And Where It Got Us”, and “Leave” pretty much define what I think of when I think about R.E.M. generally. And it has some of my favourite R.E.M. songs with the band in full-on rock mode: “Departure”, “Wake-up Bomb”, “So Fast So Numb” – these are all great songs I can happily listen to on repeat for a very long time. The album also features cameos by Patti Smith. What’s not to love? How much of what any of us are doing today is going to be this good in 21 years’ time?